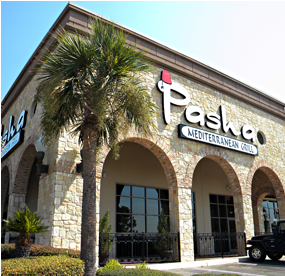 One of my favorite Mediterranean restaurant in San Antonio is definitely Pasha. The food is so good that I could eat it for two days in a row, or more. My brother introduced me to this place a long time ago, when he worked near the area and his friends from the Middle East highly recommend it. Every since I visit Pasha probably once a month! Pasha Mediterranean Grill strives to bring a unique and healthy alternative that does not disappoint. I was there this weekend with my boyfriend and thought might as well share my review with everyone. As entree I ordered my favorite dish, the Chicken Shawarma Plate [A generous serving of marinated chicken breast slowly roasted on a vertical pit & thinly sliced. Served with garlic aioli, hummus & Greek salad]. My boyfriend ordered the Gyro Kabob Plate [Two (2) skewers of lean ground beef & lamb cooked over an open flame. Served with hummus, Greek salad & tzatziki sauce] and of course both served with the delicious, warm, handmade naan [flat bread]. For those vegetarians out there this is an excellent restaurant that has a vast variety for you. It is always good to know that this restaurant is BYOB or wine. To see menu and locations visit www.gopasha.com.